J. Cavallo is a luxury lifestyle brand with a sophisticated, high fashion aesthetic. Born from a lifelong love of fashion and philanthropy, the brand celebrates and empowers the artisanal skills of women around the world. The philanthropic mission of the brand is guided by the philosophy that lasting change can only be achieved when women have access to both knowledge and resources, and leading to the support of a number of organizations, including Women for Women International. Through their design process they are changing the lives of the men and women they collaborate with around the world. Raised in Detroit, Michigan, founder Jeanine Cavallo comes from a long line of talented seamstresses, at who’s hands she learned to appreciate exquisite fabrics, as well as how to drape and cut a pattern. The structured, elegant silhouettes have a vintage take on classic pieces, with an Audrey Hepbern sensibility. Cropped boxy jackets feature three quarter length sleeves and narrow stand collars, skirts are tapered and below the knee. Boat necklines, rolled collars and draped back detailing feature heavily in the collection. The understated color story is striking in its simplicity with eye catching prints and shimmering monochromatic colorations that let the luxury fabrics shine through. With a belief in preserving skills, the collection is produced in New York, with ten percent of all proceeds from sales go to supporting artisans. Metabolism is something most of us have come to understand as the way our bodies burn or store fat. For holistic nutritionist and author of The Art of Wellness, Kristin Dahl, “metabolism affects every cell in our body. Everything we eat affects our metabolism, but you may not know that your activity, stress levels, and amount of sleep are also vital. It’s the way our body regulates weight, uses energy, and controls all other body systems, which determines our vitality, strength and life force.” Dahl, who received her training from the Institute of Holistic Nutrition, has been working for over five years with clients to help them radically transform. She has found that all areas of life affect one’s metabolism and her tips encompass it all so that you look and feel your very best. 1) Count nutrients, not calories. 2) Tune into your body’s cues and stop eating before you are full. 3) ALWAYS eat breakfast so that your body doesn’t go into starvation mode, which will stress and slow down the body’s ability to burn fat. Eat within 30 minutes of waking unless working out, in which case you can eat before or after your workout depending on how you feel. 4) Eat balanced meals & snacks throughout the day to keep your metabolism steady and fueled. One of my favorite snacks to have are slices of apple with 1 tablespoon of raw almond butter. 5) Don’t eat past 9 because this gives your body time to rest & digest. 6) Make sure to get plenty of protein throughout the day. I try to incorporate protein into every meal whether that be animal or plant based. 7) Shoot for 8 hours of sleep. Most people need this to keep their hormones regulated, which works synergistically with metabolism. 8) HYDRATE! You want to drink half your body weight in ounces. For example, if you weigh 130lbs you want to drink 60 ounces of water. You generally increase that amount if you are sweating a lot. 9) Eat healthy fats like avocados, nuts & seeds, and coconut; these all help to burn excess fat. 11) Remove refined sugars and switch to more natural sources of sweetness like honey, maple syrup or stevia. 12) Stay consistent with healthy eating, sleeping, and exercise habits. The more consistent you are, the faster your metabolism will be and the healthier you will feel. 13) Be gentle & kind to yourself–nourish, nurture, honor, and respect yourself with your thoughts and actions. Say loving things to yourself! This all plays a key role in how you feel everyday. Driven by their commitment to sustainability, CUS produce an eco friendly womenswear collection informed by environmental awareness. The quirky, casual collection has more than a hint of the bohemian, and features bright geometric prints, fluid silhouettes and comfortable wrapped and draped jersey dresses. Timeless and season-less, the CUS collection is designed to form the base of a lifelong wardrobe, not to be a fad that is enjoyed then discarded. CUS exclusively source environmentally friendly fabrications, working with organic cotton and wool, farmed with no artificial fertilizer or pesticides, and naturally grown and fed sheep. Pre consumer recycled fibers and fabrics salvaged from the spinning, weaving, and cutting process, are also used in the line. CUS work with Xisqueta wool, from the Xisqueta sheep, native to the Pyrenees, helping to revitalize old local craftsmanship through local sourcing and production, from raw fiber collection through spinning and weaving. The brand also work with innovative, eco-friendly fabric sources from a wide variety of plants, proteins and recycled waste. CUS produce all their garments locally in Barcelona, in workshops that care about the well being of their workers, which results in high quality workmanship. There are so many ways to conserve, but some are easier than others. Using the Green Garmento bag is a no brainer. The GG bag is multi-functional and was developed by Entrepreneur and businesswoman, Jennie Nigrosh, to help green our dry cleaning routine and eliminate single-use plastic. It’s a reusable garment bag that serves as a hanging hamper, a duffel bag (for clothing storage), and protection for your clothes when you pick it up or store it after it’s cleaned. This product is pretty much a game changer for your whole clothing regime. Nigrosh’s father owned a recycling plant that created cardboard. Growing up she “was taught from birth never to throw things away and most waste can have another purpose.” How many of us can say we look at our waste the same? Culturally, Americans are so used to the single-use plastic way of life. It all accumulates in the garbage, and people don’t typically see the repercussions. It turns out that on average, America tosses five pounds of trash per person per day into its landfills. While we may not see these large piles of trash being pushed into the Earth, it does not mean they are not there and causing severe environmental damage to the planet. Nigrosh is a go-g etter and her success of the GG bag is a sign of the times that we are ready to evolve as a culture. Her bags have been featured on hit shows like Shark Tank and The Today Show and in newspapers and magazines like The New York Times and People Magazine. You can even find these bags at select dry cleaners or for purchase at big name stores like Bed, Bath & Beyond or Walmart. If your dry-cleaner doesn’t use them yet you can suggest that they reach out to the GG team and get on the bandwagon. It will save their business money as well as do their part to initiate good consumer habits. Stuffing our trash into the Earth is not a smart solution and every piece of plastic counts. Nigrosh told me by using the GG bag, “the average person can save 6-8 pieces of single-use plastic garment covers per week”. The question is: can we make this functional bag an even bigger part of our culture? We must all do our part to help implement sustainable techniques, but so far so good. A luxury Spanish retreat without leaving the country. With its lush gardens, olive groves, and gorgeous villas, Rancho Valencia Resort & Spa in San Diego will make you feel like you’re on a beautiful Spanish retreat without ever leaving the country! Luxury doesn’t have to come at nature’s cost–Rancho Valencia uses landscaping that preserves water, and energy-efficient fixtures that minimize waste. The staff also composts food waste, recycles wherever possible and converts oil into bio-diesel fuel to power local school buses. Traveling with children or pets, no problem. Upon arrival to the resort, your pup will enjoy a resort pet guide, custom made doggie bed, and food and water bowls with a very special treat. Rancho Valencia even offers an in-room dining menu with dishes crafted just for pets and the hotel can arrange for childcare for your date at starting at $18 an hour. No need to skip your workout routine just because you’re away–Rancho Valencia has a state-of-the-art fitness facility which includes a brand new Serenity Yoga Pavilion, spin and Pilates classes, exercise programs and retreats hosted by top-tier professionals. Not to mention the pro-level tennis complex! There are also a variety of complimentary recreational activities at the resort, from croquet and bocce ball to nature walks and bikes for exploration. Relax and unwind at The Rancho Valencia Spa with its Watsu treatment pool, a sauna and steam room along with several treatment rooms for organic massages and facials, including our favorite orange citrus facial by Natura Bisse. With so many amenities and activities at your fingertips, you’re sure to have a vacation you’ll never forget. Paper Thinks started as a range of eco friendly, quality paper notebooks in fun playful colors, and went on to encompass canvas and recycled leather bags, and a full range of small leather accessories in the same broad range of colorful options. The notebook series comes in a myriad range of brilliant colors from sunshine yellow through to black with a rainbow in between, some with graphic stenciled prints on the cover, others in simple glorious color, and in a diversity of sizes and styles, but all contemporary, and all stylish. The notebook series is rounded out by address books, planners and plotters, all in the same brilliant range of color options. The accessories collection mimics the paper in style and choice, with small tablet folios from 100% recycled leather, wallets, change purses, cosmetics bags and card cases. Handbags cover the gamut of styles and shapes from long deep tote bags to shoppers and old-fashioned top handle handbags in bright sorbet shades. The brand tagline of “think color Think Green” perfectly encompasses the brands ethics and aesthetic statement. How much power and influence do celebrities have in today’s world? One would argue, a significant amount, and with great power comes great responsibility. Actor Sean Penn, has demonstrated (yet again) that his organization J/P HRO (Haitian Relief Organization) is committed to using power for good. 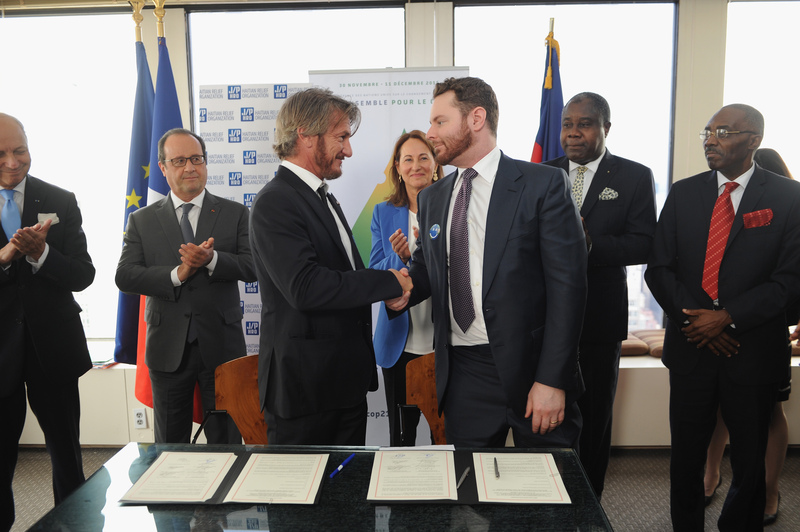 On Monday, Sean Penn and Philanthropist Sean Parker from J/P HRO met with President of France, François Hollande, along with Ministers of Ecology, Development, Defense & Foreign Affairs, and Environment from Haiti, to sign a Letter of Intent, which “formalizes a partnership for a landmark climate change initiative.” The initiative is called Haiti Takes Root and is “dedicated to the reforestation, soil preservation and development in Haiti.” This is a historically significant moment as American, Haitian & French representatives come together to take responsibility for Haitian citizens and their affected land. At one time, Haiti was 80% forest and a global exporter of natural resources. Today, less than 30% of Haiti is covered in trees and only 2% remains covered by original native forests. This significant degradation is startling and requires immediate action. The Haiti Takes Root initiative aims “to respond to climate change, build national resilience, improve the quality of soil and vegetation, increase forestry cover, and promote the use of sustainable agro-forestry and renewable energy.” The logistics of the project will be finalized for the 2015 United Nations Climate Change Conference (CoP21) this December in Paris. After the devastating Earthquake in 2010, many celebrities brought significant awareness to the destruction and global call for support. Ultimately, this project is happening “so that our children and the generations to follow live well on this planet, said Lerner Renaud, Haitian Minister of Defense and Foreign Affairs. This is power at its best: when those who have the ability to change lives and protect consecrated lands choose to take action, the most responsible thing they can do with all that power.